The author and the names in the following article have been changed due to security reasons. 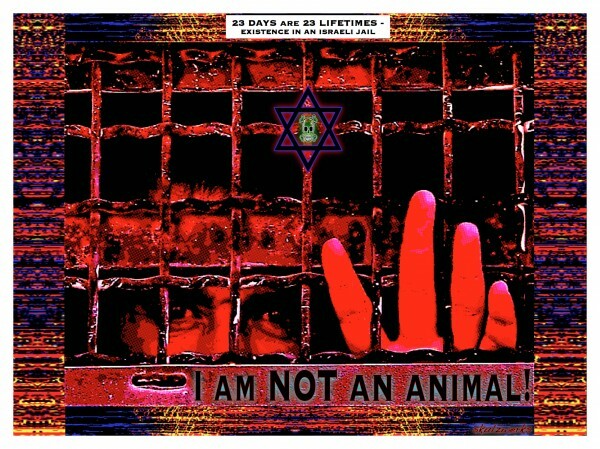 Twenty–three days is the amount of time that I spent in an Israeli jail. Twenty-three days seems like a small part of a person’s life, but it was enough time to change the rest of mine. I want to share my experiences of the twenty-three days that I spent in jail; how I dealt with what I saw there and the people whom I met. For twenty-three days my freedom was stolen. Other Palestinians are not so lucky. They don’t know if they will ever be free. One cold night in March, I threw myself on my bed after a hard day at the university. It was raining heavily outside, the weather was cold. I was tired enough to go sleep early. I didn’t know what awaited me the next day; my thoughts were focused on how I would get to the university the next day in the cold weather. I had many exams that week and I was worried about getting good grades. Because I was tired, it didn’t take more than a moment until my eyes closed and I fell asleep. What felt like a second later, my eyes opened again.I wish they had not. Suddenly there was a noise I couldn’t recognize. A huge sound shook my house; I would later find out that the sound was the front door of my home being broken into. I thought it was a nightmare. I closed my eyes and when I opened them again, a soldier was aiming his gun at me. It felt like a dream. I closed my eyes for the last time and then opened them again. The soldier was still there. He spoke in a language that I didn’t understand. I stood up and saw a group of soldiers holding my brothers, shouting and forcing them to come into my room. I realized someone was going to be arrested. I identified the soldiers as the Israeli army. I still couldn’t understand what they were saying to us, but suddenly I heard my name. They wanted to arrest me, but why? I hadn’t done anything wrong. One of the soldiers took me to another room; he took off my clothes and inspected me thoroughly. I was wearing pajamas, which of course would not protect me from the cold. I asked them in English to take me to the bathroom. When I went, they came with me. I saw my family together in one room. The soldiers prevented them from leaving or talking. My six year old sister looked at them with fear, but I was relieved because she wasn’t crying. Then I saw soldiers searching a room and throwing everything outside. I also noticed one of the doors was broken; it seemed caused by the soldiers’ violent entrance into our home. When I reached the bathroom they aimed their guns at me. I couldn’t understand why. Maybe they thought that I would jump out the window of the bathroom, maybe even fly out of the fifth floor, where we live. They took me to another room of our house. I looked at the clock; it was two in the morning. I heard the officer apologize and say that he wasn’t responsible for what the other soldiers did. I couldn’t understand how he could claim he wasn’t responsible, when he was the officer in charge. It didn’t make any sense. I heard my mother argue with soldiers loudly, I couldn’t understand what she was saying. She was too far away, but she seemed very angry. One of the soldiers draped a jacket on my back. I couldn’t wear it properly because my hands were tied. I later found out that my mother had been screaming at the soldiers to let me wear my jacket. Then, one of the soldiers took me with him. I realized then that this was not a dream, they were really arresting me. When we reached the door, I heard my mother’s voice calling me. Although I couldn’t see her, I turned to her as she said, “Be strong, don’t be afraid.” I couldn’t deny that I was scared since the first moment I realized what was happening, but now I wasn’t afraid. My mother had given me back my confidence. I hadn’t done anything in order to be arrested, and I was sure that I would come back soon. I didn’t answer my mother, I only smiled. I thought that the smile would be enough. Then the soldiers took me away. When they took me to the street, I felt like the number of soldiers was increasing. I stepped up into what I thought was a truck. The degree of this entire process seemed unnecessary. During the drive, the pain increased in my hands, they felt as if they were going to fall off. I know that more than a quarter of the Palestinian people have been arrested, but I didn’t ask anyone of them how they dealt with this pain. I could’ve screamed, but I didn’t. My mother’s words made me try to forget the pain. An hour later, we arrived at Huwarra, an Israeli military camp. A doctor arrived to perform some medical tests. Before he began, I asked him to untie my hands. Then he examined me. When the doctor finished, a soldier brought me outside, tied my hands back again and blindfolded me. I remained in the cold for about another hour. I couldn’t see his face, but I felt like he was surprised. Then he left me, and a couple of soldiers took off my clothes to inspect me. A car came to get me. They put me in a mobile prison cell. They didn’t cover my eyes this time, but I wasn’t able to see anything out of the windows. I didn’t know where they would take me. They tied my hands and feet with iron shackles, which prevented me from moving. After less than an hour, we arrived at place called BetahTickva; a place to interrogate prisoners. They took me out of the car, blindfolded me, and then took me to another doctor. My clothes were taken off and I was inspected again. They took me up a long staircase and put me in a desk. My hands and feet were tied to the back of a small iron chair and they left me alone with a young man. The first round of interrogation began. It lasted for twenty-two consecutive hours, during which my hands and feet were tied. My shackles were removed only for food and prayer. The night was long and tiring. The interrogator quickly lost his temper, and began shouting and insulting me. I didn’t know what he wanted me to say. It’s impossible to say something about myself that isn’t true.Why wouldn’t he believe anything I said? He continued screaming in my face. He threatened me, saying whether or not I answered the questions, I would stay in jail for fourteen months, but if I cooperated with them in the investigation, they would reduce the duration to six or seven months. The detective turned on the air conditioner and left me tied in the room alone. I was still wearing the pajamas which I wore when I was arrested. They took my jacket, the one which my mother insisted I wear before I was taken away. My back and neck hurt very much because my hands and feet had been tied for hours. I tried to close my eyes to rest for a bit, but the detective suddenly entered again wanting to continually make me weaker. He began shouting again and repeating the same questions. I couldn’t take it anymore. He sat silent, looked at me then said, “Ok”. I saw the redness in his face, it looked as if he was going to explode, but he held in his anger and left the room. I felt like I had won. The first round of interrogation had ended. The ones following it didn’t exceed eight or nine hours, some just only one or two hours. Sometimes, there was only one person asking me questions, other times there were several. They used a lot of methods with me, some involved incentives and intimidation while others consisted of threats. 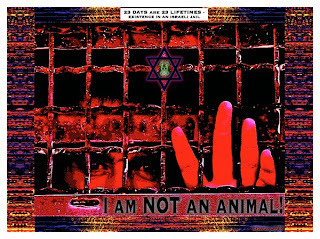 At one point, I was threatened with administrative detention. This is where a prisoner is put in jail with a delayed court date, sometimes for an indefinite amount of time. I was afraid of what they were going to do to me. After I finished several rounds of interrogation, the prison guards took me to the cells. The cells were small rooms without windows. Living there was difficult. Within the cell was a small bathroom and blankets. There was a dim light through the ceiling and two holes for ventilation; the two holes were making a very annoying noise. The grey color of the walls was depressing. Food was given three times daily. I felt isolated from the world. I kept being moved from one cell to another, unable to adapt. I thought that being in the cells was better than having the screaming detectives, but I discovered that they were the same thing; both caused suffering. On the first day, I entered a very small cell. It felt like a coffin. I didn’t expect the cells to be so bad. I was exhausted from interrogations, so I tried to get some sleep. My constant thoughts kept me from sleeping. I looked at the dim light coming from the ceiling and tried to gather my thoughts. Two days prior everything had been normal. I had been in my home and at the university spending time with my family and friends. Yet now, I was locked within four walls, unable to see the sun and sky. My mind was lost; wondering about what was happening outside of my cell. What were people doing with their freedom? When would I come out of there? What was the first thing that I would do when I left? These questions made me more anxious. Yet suddenly, I fell asleep. I woke up to a voice as the cell door opened; it was meal time. Although I didn’t know what time it was it seemed like dinner. I tried to eat something and then I went back to sleep. When I woke up I felt surprised to still be sitting in that same cell. The dim light in the ceiling was still in my eyes. I went back to sleep, hopeful in waking up in a different place, but everything was as it had been when I had fallen asleep. I slept for a long time, but nothing had changed. I was asleep, then awake, but time was lost to me. I didn’t know how long this would continue for. I couldn’t take it anymore; I screamed and hit the wall hard with my hand. Now my hand was in pain. What would I do now? I washed my face and decided to accept it. I would try to deal with things in a more rational and logical way. I was now isolated from the world. I started praying out loud, asking God to protect me. I felt more relaxed after that. I spent my time singing. I realized that I need to figure out a way to deal with life there. I was able to estimate the time between the meals I received. I organized my time between praying and sleeping, thinking only of positive things. I was beginning to adjust. I was already used to feeling lonely and adjusted to life in the cell, and then guards began to move me to other cells. I started to meet other prisoners like me. In fact I met four people during this period. The first person I met was Riyad. He was twenty-five years old. I didn’t particularly like him, he talked too much and I didn’t enjoy talking to him, but I didn’t show him that. He said strange things; I found out later that he lied a lot. He said the jail was beautiful. He claimed that it was his second experience in detention. He told me that when the investigation ended, I would be moved to a bigger jail, and that the new jail was much better than here. There I would meet many people; there would be good food, clothes, and television. I would even be able to play sports there. He said that in order to be moved, cooperation with the detectives would improve my chances. Riyad seemed to be more excited about being moved to the new jail rather than leaving prison in general. Later on, when I spoke to other prisoners about Riyad, the general idea was that he was a spy. The second person I met was Mustafa. He was thirty-three years old. He told me that he was married with two young children and this was his first time in detention. He always seemed confused and talked about his children often. He was very anxious, constantly wondering about his children. He told me he had been there for nine days. I think that my words helped him a little bit. The fourth person I met was Yahya. He was twenty years old. Yahya was a strong young man, very bold. He liked to talk about himself a lot. He spent the whole night telling me stories. He wasn’t afraid of the guards, and always opposed everything in the jail. He refused to eat if he didn’t like the food, and he would ask for more if he was still hungry. Being with him was helpful, because when he asked for food, he would ask for both of us. His behaviors also had harmful effects. He once shouted at one of the guards, and they took him out of the cell and tied him up for many hours. This was the last time that I saw him in that cell. While I was being investigated, my detention was extended twice by the court in BetahTickva. My lawyer spoke with me and tried to reassure me. Prison guards moved me into a large cell, a sign that I would be finished with the investigation. Although it was still bad, it was the best cell thus far. I saw Yahya there again, and met three other people: Ammar, Ahmad and Samer. Ammar liked smoking a lot, and there were two cigarettes per day for each prisoner. Because I don’t smoke, I would give him my share. He told me that he was arrested for working illegally in Israel. He didn’t have the appropriate permits to be doing that. Ahmad looked younger than his actual age. He was always laughing and making us laugh too. He told me that he was illiterate. I was surprised when he told me that he was only nineteen years old, and this was the second time for him in detention. Samer was a very quiet man and was always sleeping. He told me that he was unemployed, and he didn’t yet know why he was arrested, even after the investigation with him had ended. We formed a bond in that cell. All of us came from different cities. It was a chance for me to learn more about my country. I asked each one of them to tell me about their hometown. At night, we fell asleep at the same time. We ate together, and I found myself always waking up Samer to eat. We prayed together, asking God to get us out of this place.Although it was difficult to live there, those people made the time pass quicker. Ammar was telling us about the dangers of his work in Israel. His work was very hard, working in construction. He told us that his father was an old man and he was working to help his family. Yahya always told us many stories, some of them I had heard during my first meeting with him. He visited many cities in Palestine, and his stories were enjoyable. Ahmad always made us laugh, and it was very nice. His jokes made us forget about our situation, even if only for a minute. Samer spent most of his time asleep. He said that sleep was the only way to not count the time. They always asked me to sing, and I would. My voice would get tired because I was always singing. At night, before going to sleep, I would tell them a story that I had read in a book, and they felt so happy. I was the only university student there. The next day, the guards suddenly entered our cell. They were wearing strange clothes and carrying flashlights. One of the guards took me out with him and thoroughly inspected me. I felt humiliated, and when I came back to the cell Ammar and Samer told me that the same thing had happened to them. I noticed that most of the blankets in our cell had been confiscated. The situation here became much worse than before. We sat silent, not knowing what to do. One of the guards entered and called me. I wondered what they would want now. They told me that it was my turn to leave. I looked at Ammar and Samer’s faces, they appeared to be upset. All of us had become familiar with life there. The cell had become almost empty now. Although I was sad to leave them, I tried to be strong, at least in appearance and said, “It’s simple, I’m sure that we will meet one day, and we will talk about these days as a part of the past that’s gone and will not return.” This was the last time that I had seen either of them. The guards took me, tying my hands and feet again. They put me in a car, similar to the car I had traveled toward the jail the first time. I knew that my court date would be in two days. Everything was a process here. After several minutes, we reached a jail called Ramla. This jail was for prisoners to be transferred to court or to other jails. This jail contained a lot of rooms, full of prisoners. They put me in one room with a full bathroom. It was much better than the first cell. There were beds and food here was much more available, but very bad. I met four people there; Kareem, Amjad, Magdi, and his brother, Shokri. Each of them told me their story, Kareem was a thief; he entered Israel without the proper permits. He was arrested more than once for this reason. During one of his planned thefts, he killed a woman and injured another. Kareem awaited a life sentence. I was surprised that Palestinians went to jail for these reasons. Amjad was a high school student and final exams would begin in two months. He dreamt about entering the university, but he was arrested and put in administrative detention without an interrogation. He didn’t know when he would be able to leave. His words worried me, because the detectives threatened to do the same thing to me. Magdi told me that the total time of his sentence was seventeen years. This time he was arrested with his brother Shokri and sister Rana. Rana was in the women’s prison. Everyone knew that they were arrested because they were trying to help prisoners. Clearly, Magdi never spent much time out of jail. I went to take a shower and sat on the bed to relax. He explained that the Bosta is a large bus for transferring prisoners from all jails. He told me that tomorrow the Bosta will take me to another jail, and then to court. His experience had paid off. I was very happy when Magdi told me that I could see my parents in court. That night, while trying to sleep, I saw some words written on the wall beside me. Some were the signatures of prisoners and the date. This cell has obviously been used by a lot of people. One of the phrases said, “I miss you my mother”. Others said, “I have been wronged”, “Freedom for Palestine”, “The guard will not scare me”, and my favorite, “Patience is the key to salvation”. After reading these phrases, I laid there, thinking about the people who wrote those words. They were still dreaming for freedom. I hoped that dream will be achieved soon. I saw some small insects on the ground, collecting crumbs and taking it to their holes. Although I don’t like insects, I was fascinated by them. I fell asleep watching them, not knowing what tomorrow would hold. On the next day, the guards woke us before sunrise and told us that it was time to leave. We got ready, the guards counted us, and tied our hands. Then, we stood to take a small bag which contained snack food. I didn’t know how they expected us to eat if our hands were tied. I saw a big bus outside. I asked Majdi, if this was the Bosta and he confirmed that it was. The bus appeared just like any other. “But it seems normal,” I said to Majdi. A guard was standing at the entrance of the Bosta. He was carrying many shackles with him.He tied every prisoner’s feet before putting them in the Bosta. Majdi and his brother Shokri entered before me. When it was my turn, I was shocked. The appearance of the bus from inside didn’t reflect its’ appearance from the outside. The situation here was miserable. The seats were all made from iron, and weren’t suitable for long-term seating, due to inevitable back pain. The Bosta looked like it had never been cleaned. There were small windows on top; if anyone wanted to look out of the windows, they had to stand. It felt like an iron cage and even more so when the guards closed the doors. The guards sat on comfortable chairs far away from us. The Bosta was filled with prisoners. I sat alone; Majdi and his brother sat in front of me. An old man sat behind me. He was wearing glasses and had a white beard, he seemed to be exhausted. Majdi told me that the trip would last eight or nine hours. He explained that this was a part of the punishment for prisoners. They intended on humiliating us. One of the guards came on the bus, checked our names, and then closed the door. After that, everyone began to talk. Some of the prisoners were going to court, like me, some were returning from the prisoner’s hospital, others were just being moved from one jail to another. When they found out that I was a new prisoner, they were all interested in talking to me. Saleh was returning from court. This was his ninth time in administrative detention; he’d spent over four years there. Every time he was released from jail, he was almost immediately arrested. Another person who I met was Mosa, he was serving a life sentence. He was returning from the hospital after a medical examination. He spoke with confidence, speaking of his life as if it was predetermined. He seemed satisfied with this, as if jail had become his home. He continued explaining that his situation was better than others, because there were many who were in solitary confinement. One of his stories was about my old friend Naser. It was a strange coincidence; Mosa didn’t know that I knew Naser. Naser was arrested seven years ago, when he was fifteen years old. He was sentenced to twenty years in prison. Mosa told me that Naser’s family is prohibited from visiting. I asked Mosa, if he saw Naser in the future, to tell him that I was thinking of him. I felt sorry for the old man who was sitting behind me. He didn’t speak with the rest of the prisoners. I tried to talk to him, but he didn’t respond. My back began to hurt from sitting on the bus seats. I didn’t know how this old man could take it. The Bosta stopped at one of the jails. Guards opened the door, taking some of prisoners out and putting others in. A new prisoner came in and sat in the empty seat next to me. His features were strange, he was an Israeli. I was confused and asked Majdi about him. He told me that Israeli prisoners often travel with us, but they are not allowed to be in the same jail. Despite Majdi’s words, I was still scared. This person was looking at me the entire time. Many thoughts raced through my head. I knew that Palestinians went to jail for resisting the occupation and sometimes for no reason at all, but this Israeli person must have done something really wrong. What would stop him from attacking me? The presence of Israeli prisoners seemed natural for others, the other prisoners almost seemed accustomed to it. I was still afraid, this man wasn’t a guard, soldier, or detective, and he was the first Israeli civilian whom I had ever encountered. I didn’t know what to expect, my only experiences with Israelis had been violent. It was very natural to be afraid; I didn’t know how he felt about Palestinians. Suddenly he moved, trying to get something from his shoes, but his shackles made movement difficult. I thought he might get out something to attack me with. I didn’t know what to do. I pretended that I was trying to untie my bag of snacks. My heart was racing. The interrogations and the condition of the cells were much easier than this situation. But finally, he took out what he was searching for. It was a cigarette. He hid it away from the guards to smoke it in the bus. What a joke! All of this fear over a cigarette. I took a deep breath and tried to relax. After about an hour, the Bosta stopped again, and the guards took another group of prisoners off the bus, including the Israeli prisoners. Then, the Bosta set out again. I saw one of the prisoners standing and trying to look through the window. I thought that this was forbidden. I stood and tried to look out too. I saw buildings, streets, cars, and many people. They were living their lives, while we were deprived of our freedom. I saw green plains, livestock grazing, rows of trees, and even the sea. My childhood dream had been to visit the sea, and I could see it through the tiny window. I enjoyed the scenery, but the window was very small, and standing with my hands and feet tied made it difficult. My grandmother had told me that these lands were once for all Palestinians, and that the occupation had expelled her family from here. It was very upsetting that it took my being arrested to finally see these lands with my own eyes. The voice of the old man who was sitting behind me cut off my thoughts. I realized now why he didn’t answer me the first time. His name was Salem, and he was about sixty years old. He was returning from the hospital, he suffered from many diseases. He told me about his son who had been killed eight years earlier. After that, he was arrested and sentenced to twenty-five years in prison. I felt that twenty-three days was a long time, yet this old man had spent eight years in jail, and still had another seventeen years to go. I wondered if his weak body would be able to take it. He was very happy when he found out that I was a university student, because he had a son studying in a university too. Although he was an old man, talking with him was very enjoyable. The Bosta stopped and the guards took the old man, Majdi and his brother. Before they left, Majdi said, “Be patient, you will arrive soon.” The Bosta stayed there for more than two hours. My hands and feet had been tied since the morning; my back hurt and my head started to hurt too. I didn’t know how much longer it would take. It was my first time riding the Bosta, and I hoped that it would be the last. The guards asked us to get out, and they put us in another Bosta. The other Bosta was filled with prisoners. I was looking for an empty seat, when a voice from the back called my name. I turned and saw that it was Yahya. I was happy to see him. I went and sat down next to him. He told me that his court date was delayed until tomorrow, the same date as me, so Yahya would be my companion throughout the next two days. This was very good news, even relieving. I told Yahya in detail what had happened during the period of time since I had last seen him, and he told me the same thing. My headache was more and more painful. I was hungry, thirsty, and exhausted. I didn’t know how Yahya didn’t feel the same. This made me think he was really a strong man. Finally, we reached Magiddo jail, where we would spend the night. This jail was the closest to the court. The trip in the Bosta had lasted nine hours and the sun was close to setting. As usual, they inspected us before we entered, but we were now free from the shackles that had been constraining us since the morning. They put me and Yahya in cell. We ate and then Yahya asked the guards for some medication for my headache. I took the medicine and laid down, ready for some sleep. Before I closed my eyes, I thought about the day to come. I was longing to see my parents in court. I wasn’t afraid of what would happen, because after all the people who I met during my detention, I knew that I had no reason to be afraid. The screaming of one of the guards woke me up early in the morning. My court date had arrived. The guards gathered over twenty prisoners who had court. Yahya was always beside me, and, as per usual, they tied our hands and feet before heading off to court. After ten minutes, we had arrived. We were all put into one room. We were called one or two at a time and taken into the court room. Some of the prisoners were anxious, others were relaxed. I felt that I was a combination of both. I met several people there. One of them was Ameed, he was thirty-five years old, and he had two children. He was a bit anxious.He told me that he expected a jail sentence of up to twenty years. I then met Jehad. He was a very quiet man, always smiling. He told me that he expected a sentence of only one year, and he was pleased with this. The prisoners began returning from the court room. I didn’t know when my turn would come. Signs of happiness and sadness on the faces of prisoners spread across the room. Some had been sentenced for several months, others several years, and the rest had their court dates delayed. The atmosphere was tense. Everyone wanted to be released. Then Yahya’s turn came. I wished him good luck, and he took a deep breath and left. After a short time he returned. They had delayed his court date for one week. I felt a change in Yahya, he seemed sad. I asked him to tell me what had happened. He told me that he had seen his mother crying in the court room. This had clearly affected him. Even a strong person like Yahya was overcome by emotions. The sentence for Jehad was as he had expected, so he was happy. Only a few people remained and I began to feel anxious. Ameed went in before me, and then finally it was my turn. Four guards escorted me into the court room. One of the guards unshackled my hands, but my feet remained tied. The judge entered and I was ordered to stand. My assigned lawyer stood beside me. He wasn’t the same lawyer who I had met the first time. Then my parents entered. It was forbidden to speak there, but my mother was trying to communicate with me to reassure me and I smiled. The hearing didn’t last for more than five minutes. The lawyer requested to release me on bail, and the judge immediately agreed. The lawyer told me that my father would pay the bail and they would release me in a few hours. The guards tied my hands and took me back to the room. Yahya was waiting for me. I told him what had happened, and he remained silent. Then Ameed returned and told us that he had been sentenced to nineteen years. It’s a very long time. He asked me, “What about you?” I couldn’t tell him that I would be free that day. I remained silent, and he understood. Jehad tried to be cheerful, he asked me, “How old do you think I am?” I guessed fifty. He asked Ameed the same question and Ameed guessed thirty-six. He surprised us when he told us he was fifty-three. He seemed younger. I turned to Ameed and said, “I hope that you will not spend nineteen years in jail, but if this happens, you will be like Jehad, still young.” I hoped that my words helped him, even if only a little. Yahya finally emerged from his silence. He made a strange request, he asked me to sing. I tried to refuse, but he insisted, so I quietly sang. I saw Yahya’s tears. Yahya, the strong man, began to cry. He was sad to leave me and I was sad to leave him. The guards took everyone but me out of the room. This was the last time I saw Yahya. The guards came and undid my shackles and I was moved out of the court. Finally, after twenty-three days I was free. I saw my parents waiting for me and kissed their hands. In the car on our way home, I thought of the people who I had left behind. I felt as if I had left another family in jail. Everyone had a place in my heart.I hope that I won’t forget them, and I hope that I will meet them when they are free. When I got home, I told everyone what had happened during those twenty-three days. I tried to sleep, but this time in my bed, and in my room, not in the jail. But soon I woke up to a loud sound that scared me. Was I back again? I looked around me. I was still in my room, but I checked my hands to make sure that they weren’t bound. This time, it was a dream. I was still free. I learned a lot from this experience. I met people from different cities and experienced a bond with them unlike any other. I saw Palestinian lands for the first time which had been taken for more than sixty years that I had not been able to access. And most importantly, I understood what happens when freedom is lost. Twenty-three days in horrible conditions and constant anxiety showed me a glimpse into the reality of thousands of prisoners. This narrative is part of an on-going agreement between An-Najah University and The Activist, based on a series of articles by Palestinian University students.